On our drive home from Vegas to LA we decided to take the historic route 66. We came across an odd looking place called the Bottle Ranch. 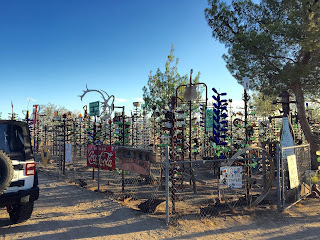 A man called Elmer created a ranch of bottles for people visit and take photos of. He has welled rods on to poles by hand and placed glass bottles on each one. There are wind chimes and other crazy creations dotted about. My husband and I found an old Willy’s jeep, which we loved because we have a new Willy’s Jeep. I found an old typewriter and posed for a photo. The field of bottles was amazing to see and a lovely way to stretch your legs. It is open from sunrise to sun set and the cost fee is a donation when you leave.